More and more Minnesotans are joining the ranks of boat owners who find enjoyment in the leisure activity of boating and fishing. Whenever you leave the dock or put your boat in the water, you are required by law to have safety equipment on board. The equipment you need depends upon the size of your boat and what makes it go. TO MEASURE YOUR BOAT: You measure length overall from one end (stern or bow) of the hull to the other end along the center line of the hull. Okay . . . so now you know what class your boat is, what equipment do you need to carry when you go boating? The laws require certain equipment to be carried aboard boats, depending on the size and intended use of the vessel. These minimum boating requirements can be found in many places, including at BoatSafe. before casting off, to ensure a fun and safe boating experience. 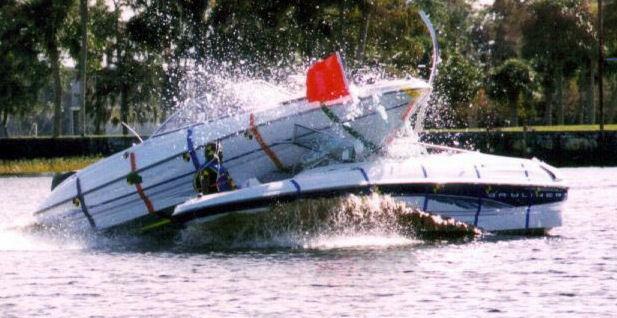 The purpose of the Boating Rules of the Road is to help avoid an accident. Boating collisions usually involve two boats, or a boat and a fixed or floating object. Collisions between boats often occur when the operator of one or both boats is not paying attention to where they are going, or if the “Rules of the Road” are not being followed. Boat operators need to be aware that traffic can exist on the water from all directions. Keeping a watchful eye can help you to avoid collisions with other skiers, swimmers, boats, watercraft and with foreign objects. Collisions with fixed objects, such as sand bars, rocks or other hazards to navigation often result because the operator is unfamiliar with the area, or ignores navigation markers. Striking a floating object in the water, such as a log or snag, is usually the consequences of not keeping a good forward lookout at all times. Another thing your boat comes in contact with every time you use it (other than water) is the dock. Docking can be a boat’s worst nemesis. Chips, dock rash, and other damage can occur during the docking process. In spite of your best efforts, accidents do happen and when they do, you want the assurance that your boat will be restored to its original beauty. Repairs should be done by a professional Minnesota collision center to ensure the boat is a seaworthy vessel. Contact a reputable Minnesota boat repair company that has experience in boat trailer repair, collision, structural, and storm damaged boats. Whether caused by a storm, collision, or just normal wear and tear, once damage has occurred, it is imperative to quickly get the damage repaired to seal out moisture and protect your boat or watercraft from further damage.